Every great race season begins with a plan. Here are some MTB race season planning tips and considerations when laying out your schedule for the year. First, here’s a list of the tools and concepts we’ll use in the planning process. The PMC is the best tool for planning training volumes. Ramp rate is the rate of change in CTL (chronic training load from the PMC). It’s convenient to measure ramp rate as the rate of change in CTL per week. What is the upper limit of your personal sustainable CTL peak? Periodization: What to do and when to do it. You want to hit all aspects of your fitness and skills, building endurance, threshold, VO2 power, and rad tech skills. Specificity: Training becomes focused on the predominant features of your goal event as it approaches. If a 100 mile MTB race is the goal you’ll have a strong endurance and pacing focus close to race day. If its XC, you’ll be working higher intensities as the event approaches. 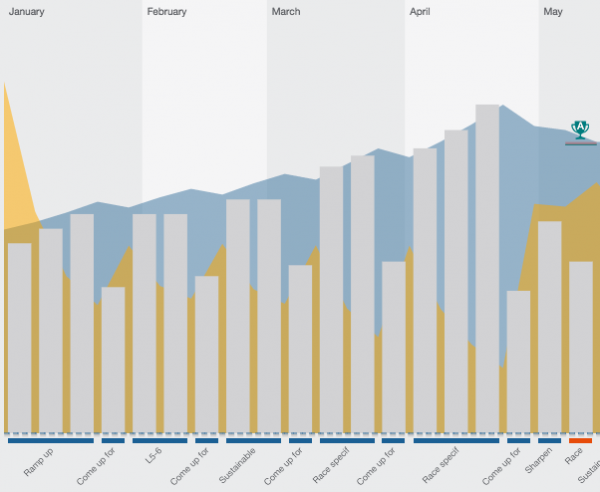 TrainingPeaks premium members have access to a season planning tool. By far, the best season planner I have used, including season planners I’ve built myself. They hit a home run with this tool. If you’ve used a power meter for a full season and have been consistent in downloading your files you’ll have a great history from which to draw conclusions. Don’t worry if you don’t use a PM, the concepts still apply. Use hours/week as a guideline instead, keeping in mind hard hours count for more than easy hours. This is especially true when focused on building threshold and VO2max power. TSS doesn’t account as well for the muscular repair needed after intense workouts as it does for endurance workouts. When working to build threshold or VO2 powers, reign in your ramp rates at or under 2/week. It might be best to keep it at 0, depending on your CTL starting point. Ramp rate can be higher in endurance periods, but should still in the single digits. We have found over the years a good starting point is a CTL of 70-80, or about 70%-80% of peak sustainable CTL, whichever is lowest. When at your peak sustainable CTL your body doesn’t have enough headroom to sustain high intensity training blocks, build power, and keep up with recovery demands. Focused on long endurance events? With a higher threshold power you will fatigue at a slower rate for a given output. Threshold power is important for you! Focused on short events? You can build higher top end outputs after tapering down from a high CTL peak. Endurance is important for you! Whatever your focus, hone in on specificity as race day approaches. Farther out from race day focus on aspects of fitness less specific to your goal event. For the 100 miler example, this means focusing on top end outputs farther out from race day, say 16 to 8 weeks out, while hitting endurance 3-8 weeks out. Once you transition from a high power focus to a high endurance focus, maintain your top end with periodic shorter top end workouts. Conversely, throw in a longer ride every 2-3 weeks while working top end. This MTB race season begins with a general ramp up to 70 CTL. Once achieved, and after an easy week, a focus on VO2 power lasts 2 weeks. Next comes a sustainable power block, then finally 2 blocks of race specific CTL building. After that block you are ready for some deep rest, bringing TSB positive, and sharpening up for race day. With good pre-season planning you can set yourself up for a great season. PMC planning can help you know how much to do, and keep you honest when you get the impulse to over do it. As a result you’ll race better and feel good while doing it.